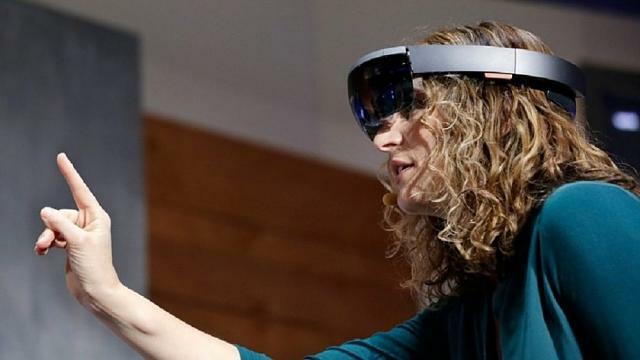 Over the last few weeks, we’ve seen some really impressive demonstrations of the capabilities of Microsoft’s HoloLens mixed reality all-in-one headset. The system costs $3,000, so it only makes financial sense to buy one right now for certain applications, like construction. The HoloLens holds the potential to save money during the planning and construction of anything from a Mars rover to a bathroom. While it is expensive, the headset is able to understand its location wirelessly indoors or outdoors with incredible accuracy — a technical feat no other augmented or virtual reality technology has been able to match in a consumer product. This critical feature (sometimes called “inside out” tracking) means that as the price comes down and features improve a lot more people will find reasons to bring this kind of equipment into their home. We found the below five videos (plus the two linked above) do an incredible job showing the potential not just for HoloLens, but for a mixed reality future living with AR and VR technology as part of our everyday lives. If you don’t already believe AR and VR are poised to change our lives these videos should help change your mind. This demo shows a person wearing HoloLens and using it to insert a virtual sphere inside of a bush to provide guidelines to trim it into that shape. Essentially, it’s taking the old idea of a coloring book — where you try to stay inside the lines — and applying to the 3D world around us. We’ve seen a number of games demonstrated on HoloLens, such as Fragments and Young Conker, which come with the devkit. But seeing a 3D emulation of Super Mario Bros. is one of the most eye-opening yet. HoloLens has a relatively limited field of view when compared to VR headsets, so you’ll only ever see virtual objects floating in a rectangle in the middle of your vision. This poses some very challenging design problems to game designers. Many ideas that work great in a fully immersive VR world — where your mind believes you are somewhere else — just wouldn’t work very well playing in the real world with virtual objects inserted into a small portion of it. Classic video games like Super Mario Bros., however, were built for square and rectangular screens. This may make them an ideal fit for a few minutes of fun distraction inside HoloLens. Be they on billboards and street signs or the fronts of buildings, words meet our eyes almost everywhere we look, and it’s kind of astonishing how ugly most of these words actually look when you read them. Typography sets apart easy-to-understand text from something that’s frustrating to read. The $3 app Typography Insight fron Dong Yoon Park offers a pretty compelling demonstration of how you could see how a particular type style will look before it gets put in the real world. Say goodbye to ugly signs. A number of similar videos are on YouTube, but this particular demonstration shows how HoloLens can help teach someone to play the piano. It overlays which keys to press directly onto the keyboard itself in a rolling fashion similar to Guitar Hero. This last video seen on Twitter shows how HoloLens could be used to visualize a motion capture performance while it’s underway. A robotic figure repeats the same moves as the performer, potentially allowing filmmakers or game designers to more carefully direct performances that could bring more life out of the digitized character. Shows some potentially brilliant uses. If someone had shown me Mario Bros looking like that back when I had a NES. I would have thought they came from another planet! Last edited by VirtuaTyKing; 09-08-2016 at 04:06 AM. That is some impressive stuff! I still can't justify 3000 dollars, and that is IF you can even get one. It's not exactly an "off the shelf" product! Still it's nice to dream! I bet if I could spare that amount of money I would buy one for sure, that's a early version of the Iron Man helmet. I feel like AR will be more useful than VR for real-world applications. I can already envision having an AR work-space: Real desk and chair, real keyboard and mouse connected (wirelessly). Virtual multi-monitor setup. You can actually get work done, not just for entertainment. Coworkers can't see your screens, should this become socially acceptable to use at an actual workplace. I don't think AR is more useful than VR, I think are meant to do different things, what I think is in the future both technologies will be in the same device, also both technologies will be available to use at the same time. That's kind of the way I see it, VR puts you with characters and in places you have never been before, AR puts places and characters in your living room that never have been there before, doesn't seem very useful to me, unless like you said they somehow marry the two. I'm wondering if Chemy JMHT was replying to my previous post. If so, I meant to imply that it could be more useful for real-world applications (ie productivity). -It's difficult to PRODUCE content in VR. Text input methods rely on voice or tapping through a visual keyboard. With AR, you can use and SEE and actual keyboard and mouse, and have that tactile feedback. -VR is fantastic for CONSUMING content, because of the reasons you mentioned, like being in a totally different world. I think you are right, that's why quotes are always good, I do see your point how AR can be useful in productivity, to me it's kind of like the screen you see in Syfy movies like in futuristic military movies where they are looking at 3 dimensional diagrams of the various troops and carriers or like a screen projection in a navy or air battle, something like that, it has a lot potential for civilian use. I don't actually remember lol. but even VR works in a productive way, is totally useful for training in areas were a simulation will show you things otherwise will be dangerous or difficult to live, also VR is too in the early ages, right now you can use a virtual keyboard on VR just by using the remote (Rift, don't know Vive or PSVR) and a mouse just by looking straight to the thing you want. In the AR case, it can be use in a real situation, VR allows to train as an astronaut repairing a satellite around the earth, AR will help you when you are actually there giving you vital information. I think in the next years we all will use both technologies according the situation and with the same device, as now we are using the smartphones for more than just making calls like ten years ago.